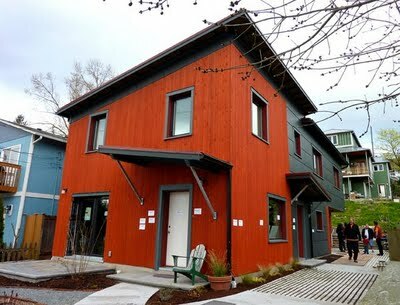 This Seattle passivhaus will use 70-90% less energy. The new building above doesn't look like anything special, but it is. It is Seattle's first permanent building designed to meet the Passivhaus standard, which means it will use 70% to 90% less energy than buildings constructed using normal standards. Highly insulated walls and windows. There are already over 25,000 homes built to the Passivhaus standard in Europe -- mostly in Germany. The building above did cost about 10% more in construction costs, but in Germany (where they have some experience in this type of construction) the additional cost runs about 5% to 8%. The beauty of this is that the small extra building cost is quickly recovered by the huge savings in energy. Just think of how much could be saved by cutting gas and/or electric bills by 70% to 90%. The house above doesn't even have a furnace. It can easily be heated by a couple of small baseboard electric heaters that would only have to be used on very cold days (and then for only short periods of time). Most of the time the house would be sufficiently heated by the excess heat from appliances, from people, and from sunshine coming in through the windows. The heat recovery ventilator does have to run 24-7 when the windows are closed, but it only draws about as much electricity as a 50-watt bulb. Now some of you may be saying that since you live in the South and Southwest where the winters aren't too bad, this kind of construction wouldn't be as valuable. Not true. The house can keep in cool air as easily as it does warm air -- meaning an air conditioner (preferably a very efficient one) would have to be used for only short and infrequent periods of time. This house saves on energy costs all year. So why aren't all new homes and other buildings constructed using the Passivhaus standard? That's a very good question. Using this construction method would not only save owners a ton of money in energy costs, once they became numerous they would be an important part of energy conservation for the country as a whole -- meaning far fewer dirty and polluting electric power plants would be needed to heat and cool them (which would be important since the U.S. seems determined to keep using coal to produce electricity). It would also reduce the need for natural gas and heating oil. If we were a smarter country, we would require all new construction to use the Passivhaus standard when feasible. But don't hold your breath for that to happen in the United States. That would reduce the need for oil, gas, and coal. And our politicians are far too busy protecting the corporations supplying these energy sources. They are not about to do anything that would reduce the need for these carbon-based and environmentally-damaging fuels. There are those who say that renewable energy sources (like wind energy, wave energy, solar energy, etc.) could never supply our total energy needs. That may or may not be true, but if we built much more efficient buildings and drove much more efficient cars and used other conservation methods we might be able to do it. It's too bad that our politicians are more interested in protecting corporate profits than they are in solving our energy problems. Many of the solutions, like Passivhaus, are already out there. All we need is the moral and political will to begin using them.